The humanitarian crisis in Yemen has worsened “dramatically” in the last week since UN-sponsored peace talks collapsed and fighting resumed in the port city of Hodeidah. Lise Grande, UN humanitarian coordinator, said on Thursday that “hundreds of thousands of lives hang in the balance” in rebel-held Hodeidah, where “families are absolutely terrified by the bombardment, shelling and air strikes”. The three-year war has unleashed the world’s most urgent humanitarian crisis in the nation of 28 million people with 22 million dependent on aid. Yemeni forces, backed by a Saudi Arabia and United Arab Emirates-led coalition, seized the main road linking Hodeidah to the capital Sanaa, blocking a key supply route for the Houthi rebels in control of the country’s north. “The main entrance in Hodeidah leading to Sanaa has been closed after forces backed by the UAE took control of the road,” a pro-coalition military source told Reuters news agency. Residents said the city’s main eastern gate had been damaged in air strikes and fighting was continuing on secondary streets off the main road. Doctors and medics in two hospitals in Hodeida province told the Associated Press news agency that 50 people have been killed in the past 24 hours. 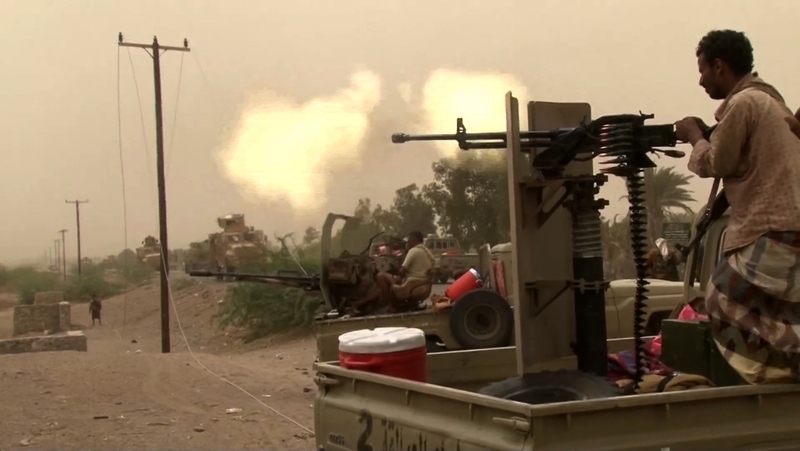 Coalition forces – which aim to restore the internationally recognised government of Abd-Rabbu Mansour Hadi, who fled Yemen after the Houthi takeover – believe their control over Hodeidah by cutting off supply lines would force the rebels to join the negotiating table. However, Al Jazeera’s Andrew Simmons, reporting from neighbouring Djibouti, said there were “warnings from all quarters that this offensive is the last thing needed in the run-up to an attempt to get some sort of dialogue going”. Meanwhile, Meritxell Relano, UNICEF’s representative in Yemen, said more than 11 million children faced food shortages, disease, displacement, and lack of access to basic services.